On 1 December 2012 The Most Rev Vincent Nichols, Archbishop of Westminster gave an address to the Venerable English College for the Feast of the College Martyrs to mark the 650th anniversary of the founding of the English Hospice on this same site. Her Majesty the Queen was officially represented at this Mass by their Royal Highnesses the Duke and Duchess of Gloucester. 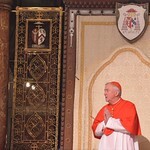 To read the homily either click on the related files link under the picture of the Archbishop or read the text below. It is remarkable to ponder, on this day, that since 1362 English and Welsh people have gathered right here to rest and pray, as they have come to Rome to grow in faith. Across the centuries people from every walk of life have been here, often assembling as a fairly motley crew – not unlike us today – with, of course, some notable exceptions! Your Eminence we are grateful for your presence, which so raises the tone of this congregation. Your Royal Highnesses, we are so honoured by your presence and by the graciousness of Her Majesty the Queen whom you represent to us today. This is such an historical occasion and one that will always feature in the long history of this institution which we are marking during this 650th anniversary year. Indeed, your presence here reminds us of the heights to which the English Hospice rose when, in the period towards the end of the 15th century, it was known as ‘the King’s Hospice’. We are glad that once again the Royal family of our nations is officially present in this place. As we know, with the coming of the 16th century more difficult times arrived and the Hospice became a seminary in 1579. Two years later, on 1st December, Fr Ralph Sherwin became the first martyr priest of the new College. This year, then, we celebrate this Martyrs’ Day in the context of that 650th anniversary, an anniversary which is coming to a close in great style, with our Royal guests here today and a Papal Audience to come on Monday. There is another context, too, for our celebration and that is the beginning of the Advent season, starting tomorrow. The word Advent has, or course, two layers of meaning. It reminds us that we are on a journey, and a journey with a focus. We are moving towards a crucial destiny, our final meeting with Christ, our King and Judge, present among us in the new-born child, Jesus, in whom the fullness of the Godhead is found. And the word Advent also points to an arrival, the advent of a person of note and distinction. Indeed, the full New Testament phrase for this season is Adventus Domini, the coming of the Lord, both his coming in our time and his coming at the end of time. In time he comes in humility and suffering; at the end of time as we know it, he will come in glory and power. In many ways the martyrs of this college make real this double advent. As with all martyrs they have the keenest sense of their ultimate destiny. It is as if heaven is almost within their grasp. They sense its joy even as they face dreadful suffering and death. They know their journey is almost complete and they rejoice! And in their lives and witness they wish nothing more than to point to the Lord who is coming. They are heralds of the Adventus Domini. They witness to that coming in the Word of the Gospel they proclaimed, in their faith in the Church, in the Sacrifice of the Mass for which they were willing to risk their freedom and life, and in the role of the Petrine ministry in the Church. This ministry they knew to be a precious and necessary gift of the Lord, given so that the Church would maintain her faithfulness to the Lord and not to the temporal powers of any age or state or parliament. The author of Ecclesiasticus is more graphic in the description of the struggles and sufferings of those who stay faithful to the Lord rather than bend to current fashion or requirements. ‘My life has been close to death’, he says echoing the experience of our martyrs, but ‘Then I remembered your mercy Lord…and how you deliver those who wait for you patiently.’ Such is the witness of great faith, especially when waiting patiently involves the agonising pain of cruel execution. Surely one of our greatest joys is to be part of that harvest. The deaths of the 44 martyrs of this college which we celebrate today are like 44 grains of wheat which have not remained single grains but have burst forth into a rich harvest stretching now over these four subsequent centuries and, we trust, bringing love and service to all to whom that harvest has been sent. And it is surely right and proper that today we include in that harvest the transformation of the relationship between Christians of different churches and denominations. When, in 1970, one group of English and Welsh martyrs were canonised by Pope Paul VI, he prayed ‘that the blood of those martyrs would be a source of healing for the divisions between Christians.’ Not only do we make that prayer our own again today, but we also rejoice that it is being answered in our time. Today we are very conscious of wanting to deepen in our church and in our lives a new spirit of evangelisation. The martyrs are great inspiration for us, in their eloquence, in their courage, in their steadfast witness to the truth of Christ encountered in the life of the Church. Today we seek, again and again, to work together with our fellow brothers and sisters in Christ to offer a common and united witness to the Lord, both in word and in the work of charity and service. Indeed, the evidence is there, up and down our countries, that such cooperation and mutual commitment is now part of our daily effort, perhaps now a little unsung and easily lost behind the noisy controversies on which some so love to concentrate. Today’s celebration of the martyrs, on the cusp of Advent, reminds us of an essential quality in that work of evangelisation: all we seek to do and say must have within it a strong witness to the reality of heaven. Again and again we witness to the hope which ultimately drives us forward: that we long to be with the Lord, to know the fullness of his love and the glory of his face wherein our true satisfaction lies. This vision kept our martyrs true to their Lord at those most testing moments. In our time it is our task and privileged to proclaim this same truth to the hungry souls of so many people and invite them to share with us the peace and joy of such a blessed hope which becomes our joy and guide in every trial.